In her hit single “No,” Skechers spokesperson Meghan Trainor sings, “You need to let it go, you need to let it go, need to let it go, nah to the ah to the no no no.” Though Trainor’s advice is for the men who annoy her with unwanted flirtations, it’s also quite apt for women who approach and pet wild bison. 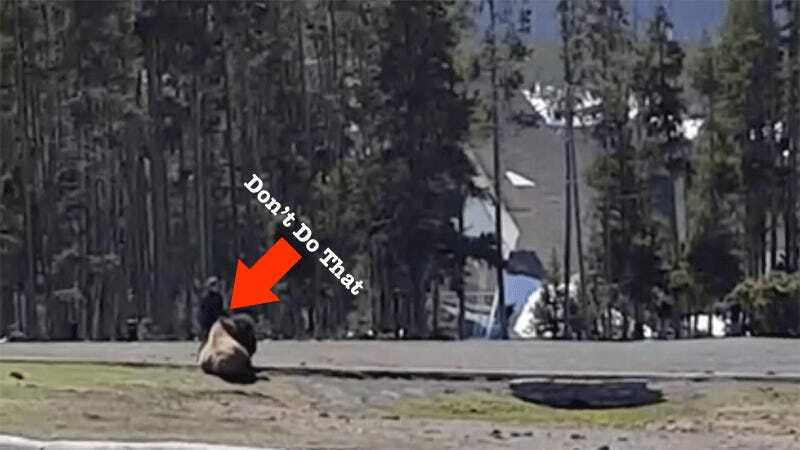 In a video reported by The Billings Gazzette, a visitor at Yellowstone National Park can be seen walking up to a wild bison and petting it, apparently unaware that bison are more than capable of killing humans who get too close. Those filming the woman’s encounter (which you can watch in the video below) can be heard saying things like, “She’s totally antagonizing it,” “I just wanna go yell at her,” “It’s people like her that just ruin it for everybody,” and, “Is she stupid?” Solid commentary all around! Remember, everybody: you should never pet a bison, but you should definitely buy “No” on iTunes.